The founding of the United States of America was certainly not the "pretty picture" John Trumbull's Declaration of Independence leads the viewer to believe. More specifically, the events surrounding the Declaration of Independence had very little resemblance to this now famous painting. A note to start things off: it is often assumed that Declaration of Independence depicts the signing of the Declaration of Independence (an event which began on August 2nd, but continued for months as delegates arrived in or returned to Philadelphia). It could also be assumed that the painting depicts July 4th, Independence Day. In actuality, it is meant to depict the events of June 28th, 1776, when the Committee of Five (L-R: John Adams, Roger Sherman, Robert R. Livingston, Thomas Jefferson, Benjamin Franklin) presented their draft of the Declaration of Independence to President John Hancock and Congress. Trumbull began work on Declaration of Independence while in Paris a decade after the Declaration of Independence. His painting was based in part on conversations with his friend Thomas Jefferson, then in Paris as U.S. Minister to France. Yale University Art Gallery has Jefferson and Trumbull's initial sketches of the Assembly room, though Jefferson misremembered certain details. But Trumbull also took creative license based on the likenesses available to him. 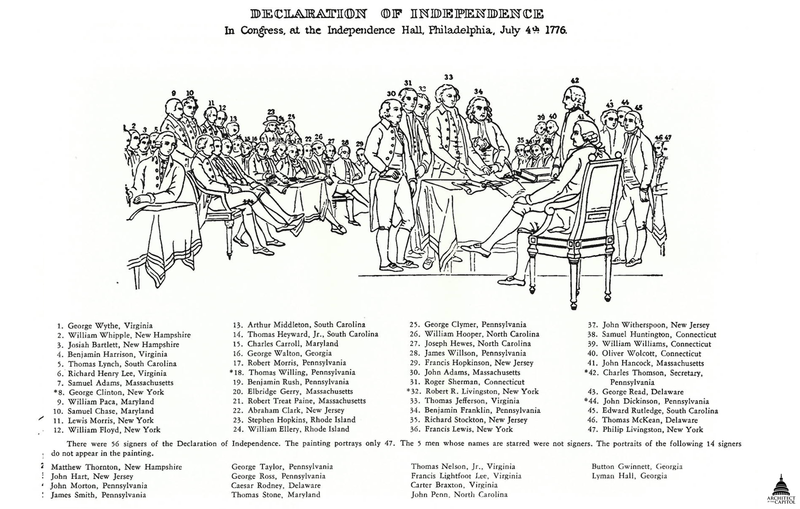 Declaration of Independence includes 42 of the 56 signers, as well as several men who did not sign, for a total of 47 portraits. 36 of these portraits were taken from life, and the others were copied from existing portraits or from relatives (see Benjamin Harrison, below). Though Trumbull worked on the painting for years in hopes of including all of the signers, the lesser-known delegates and the ones who died in the years just after the Declaration of Independence was signed didn't make the cut. Both Jefferson and Adams apparently advised Trumbull that, in cases where no portraits could be found to copy, the delegates should be left out rather than poorly represented. After decades of work, Trumbull was commissioned to produce a monumental version of his Declaration of Independence for the Rotunda of the U.S. Capitol. He completed the painting by 1818, and it was installed in the Rotunda with his other monumental works in 1826. Virginia: Carter Braxton, Benjamin Harrison, Thomas Jefferson, Francis Lightfoot Lee, Thomas Nelson, Jr. Supplemental images of delegates not included by Trumbull courtesy of New York Public Library's Digital Collections. L-R: Morton, Stone, Nelson, FL Lee, Braxton, Penn, Gwinnett, Hall, Alsop. We have followed Adams' and Jefferson's advice and excluded three delegates rather than including poor representations of them. Click here for a key to all of the figures in Trumbull's Declaration of Independence. Take a closer look at the historical inaccuracies and intriguing stories behind this iconic painting. According to a letter Trumbull wrote to Jefferson in 1817, he painted Whipple from memory. Whipple is in another famous Trumbull painting, The Surrender of General Burgoyne (Brigadier General Whipple is the fifth figure from the right). In 1819, after seeing Trumbull's Declaration of Independence in Boston, Benjamin Waterhouse wrote to Thomas Jefferson that "The picture has not given that general satisfaction the intimate friends of the painter probably anticipated." Waterhouse specifically pointed out Trumbull's treatment of Samuel Adams, one of the most recognizable patriots then and now, seated next to and almost entirely obscured by Richard Henry Lee: "Elbridge Gerry for example, has a very conspicuous position, while Samuel Adams is scarcely discoverable in the crowd of ordinary members." Some viewers believe that Jefferson is standing on Adams' foot, but this is just an optical illusion (though their feet more clearly overlap in engravings based on the painting). A more interesting note is that, though Jefferson is the star of the painting, due to his height, his red vest, and his hands on the Declaration of Independence, Adams is at the exact center of the painting. Adams' stockinged legs (along with a few other men's legs) are also front and center; in 1828, after the monumental painting had been installed in the Capitol Rotunda, John Randolph called it "the Shin-piece, for surely never was there before such a collection of legs submitted to the eyes of man." Williams was elected to replace Wolcott, who was seriously ill, but there is no record of Williams' attendance in Congress prior to the Declaration of Independence. Meanwhile, Wolcott likely left Philadelphia on June 28th, because he arrived in New York on July 1st. Williams arrived in Philadelphia in late July, while Wolcott returned on October 1st, and both men were able to sign the Declaration. Hopkins is distinguishable as the only delegate wearing a hat. His hand trembled as he signed the Declaration of Independence (though his heart, famously, did not), and his poor health caused him to resign from Congress in September. These three delegates were present for the debates and vote for independence, but abstained from voting (see below). Clinton, who would later serve as Vice President under Jefferson (post-Burr) and Madison, left shortly after July 4th. He was recalled to the New York headquarters of the Continental Army by General George Washington. Alsop resigned on July 16th, and Wisner left Congress about the same time, taking his seat in the New York Assembly on July 23rd. Consider the fact that one of the five men responsible for drafting the Declaration of Independence did not actually sign it. Livingston was a member of the Committee of Five, and was present for the debates and the vote for independence, though he and the other delegates from New York abstained from the vote based on instructions from their constituents. Livingston returned to New York later in July and never actually signed the Declaration of Independence, though his cousin Philip Livingston did (see below). Actually, Robert R. Livingston was not a signer of any of the founding documents, but he did assume a prestigious role in 1789: as Chancellor of New York, he administered the first presidential oath of office to George Washington in New York City, then-capital of the United States. In the months before and after the Declaration of Independence, several states were working on their own constitutions, including New York. On June 26th, this Livingston petitioned the New York Assembly so that he could leave the state convention and rejoin Congress in Philadelphia. According to John Witherspoon, he arrived on or before July 3rd. New Jersey elected all new delegates on June 22nd. Hopkinson arrived in Philadelphia on June 28th, and was likely in Congress on that day. According to John Adams, Clark, Stockton, and Witherspoon all arrived on July 1st. Hart arrived sometime later in July. All five new delegates signed the Declaration of Independence for New Jersey. AKA the Pennsylvania nay-sayers. Between June 28th and July 1st, Pennsylvania had seven delegates: two (Benjamin Franklin and James Wilson) in favor of independence, four (Dickinson, Humphreys, Willing, and Morris) against, and one (John Morton, see below) undecided. On July 2nd, Morris and Dickinson abstained from voting, and the Pennsylvania delegation was able to vote in favor of independence. It is doubtful that Dickinson, Humphreys, or Willing returned to Congress after July 4th (though Dickinson was later elected as a delegate from Delaware), but Morris did. Even though he voted against it, he later signed the Declaration of Independence. Morton was uncommitted on July 1st, and swayed in favor of independence on July 2nd. He was present on June 28th and had a critical vote for independence, and yet he is absent from this iconic scene. AKA the Pennsylvania recruits. Pennsylvania voted for independence, but only by way of dissenters not showing up to the vote. To avoid such situations in the future, on July 20th, the Pennsylvania Assembly sent five new, staunchly patriotic delegates to Congress. A few arrived on the day they were elected (the convenience of Congress meeting in Philadelphia). There is no written evidence of Taylor ever attending a session of Congress, but since his signature is on the Declaration of Independence, he must have, on or after August 2nd. The other four men signed as well, even though they were all elected weeks after the vote for independence. As with New York, Maryland was at work on a state constitution and some of Maryland's delegates to the Continental Congress were also delegates to the state assembly at Annapolis. On June 21st, the Maryland Convention instructed its delegates to Congress to ask permission to return to Annapolis, but insisted that they "not leave the Congress without such permission, and with out first having obtained an order that the consideration of the questions of Independence, foreign alliance, and a further Confederation of the Colonies, shall be postponed until Deputies from this Province can attend Congress." But several delegates were already home or on their way. Chase and Tilghman left on June 14th; Chase returned on July 21st, and signed the Declaration of Independence with his colleagues on August 2nd, but Tilghman did not return to Congress until late 1776 and did not sign the Declaration. Paca, Rogers, and Stone remained in Philadelphia to represent Maryland on June 28th. Rogers was likely in attendance on July 4th, but there is no record, and he left Congress soon after, if not before, the vote for independence. Carroll arrived on July 17th, and although he wasn't even elected as a delegate to Congress until July 4th, he signed the Declaration (and died in 1832 as the last living signer). Wythe is perhaps best known as Thomas Jefferson's mentor, and Lee presented the initial resolution "That these United Colonies are, and of right ought to be, free and independent States..." back on June 7th. Both delegates left Philadelphia on June 13th; Lee returned in late August, Wythe in September. Despite missing the debates and the vote for independence, both men signed the Declaration of Independence upon their returns to Congress. In fact, if you look at the order of the signatures of the Virginians, it appears as though Thomas Jefferson intentionally left room above his name for these two elder statesmen. Both men also received drafts of the Declaration of Independence from Jefferson, annotated so that they could distinguish between the original text and the text as debated and amended by Congress. After receiving his copy, Lee wrote to Jefferson that "the Thing is in its nature so good, that no Cookery can spoil the Dish for the palates of Freemen." Since there was no existing portrait of Benjamin Harrison, Trumbull painted his son, Benjamin Harrison VI, who apparently resembled him more than Harrison's other son, future (short-lived) President of the United States William Henry Harrison. Harrison was Chairman of the Committee of the Whole, which explains his prominent position in the painting and his note-taking. Two delegates from Virginia who were absent on June 28th are included in this painting (Richard Henry Lee and George Wythe, see above), while three delegates who were present were left out. Braxton was one of a handful of delegates (including the nay-sayers from Pennsylvania) who believed the Declaration of Independence was too premature. North Carolina was another state forming its constitution in the summer of 1776, and Hooper was in North Carolina when the vote for independence took place. Hooper and Penn had both left Philadelphia back in March, though Penn returned earlier, around June 20th. Hooper returned later in July, and was able to sign the Declaration of Independence. It is fascinating that Trumbull depicted Hooper (who was absent on June 28th) and not Penn (who was present). Gwinnett and Hall were present on June 28th and signed the Declaration on August 2nd, but they were not depicted by Trumbull. The Journals of the Continental Congress do not mention George Walton until July 17th, but it is likely that he was in attendance as early as June 29th, when he delivered a letter to John Adams. So, the one Georgia delegate Trumbull included was the only one (most likely) not in the room on June 28th. Trumbull's Declaration of Independence can also be found on the back of the $2 bill. But this engraved version includes even fewer Founding Fathers: five figures on the left (Wythe, Whipple, Bartlett, Lynch, and Walton) and two figures on the right (McKean and Philip Livingston) are cut off, and two unidentified figures were added. So yes, "the reality is messier and richer, kids". Or, as Samuel Adams Wells (grandson of Sam Adams) wrote to Thomas Jefferson, "The painting executed by Col. Trumbull, representing the Congress at the declaration of independence will, I fear, have a tendency to obscure the history of the event which it is designed to commemorate." John H. Hazleton, "The Historical Value of Trumbull's 'Declaration of Independence'", in The Pennsylvania Magazine of History and Biography vol. 31, no. 1 (1907), pp. 30-42. Update, November 2016: "No John Trumbull" has been recorded by The Roots and released as the first track on the Hamilton Mixtape. Update, February 2018: Errors in calculation and in the description of John Alsop, George Clinton, and Henry Wisner (June rather than July) have been corrected.